It may have been Christmas morning and the Aquarium was closed but the animals in the Giant Ocean Tank still needed lots of food and care. In the spirit of the holidays we also prepared some special treats for some of the GOT’s inhabitants. 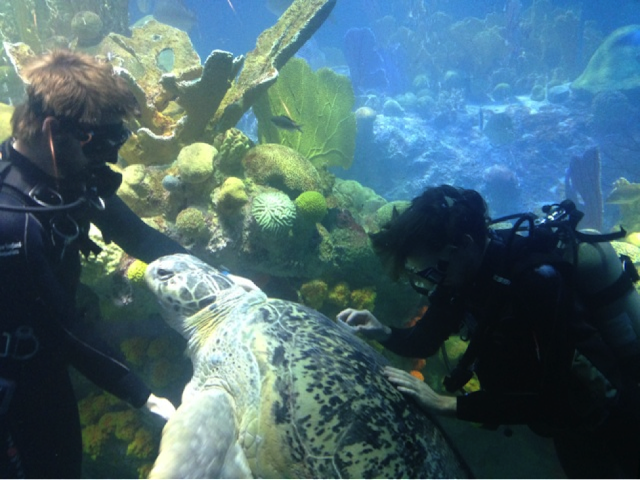 Daire gave Myrtle some special attention today in the form of a “back-scratch” by scrubbing her shell. 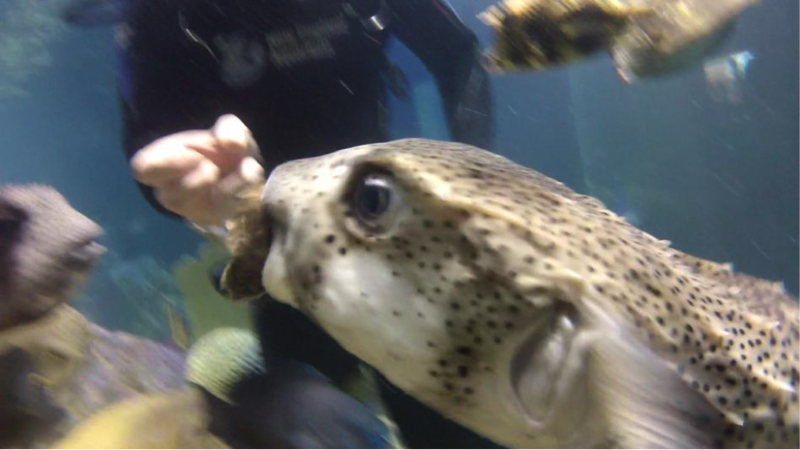 Our striped burrfish and porcupinefish got a special treat today that they really love – crabs! 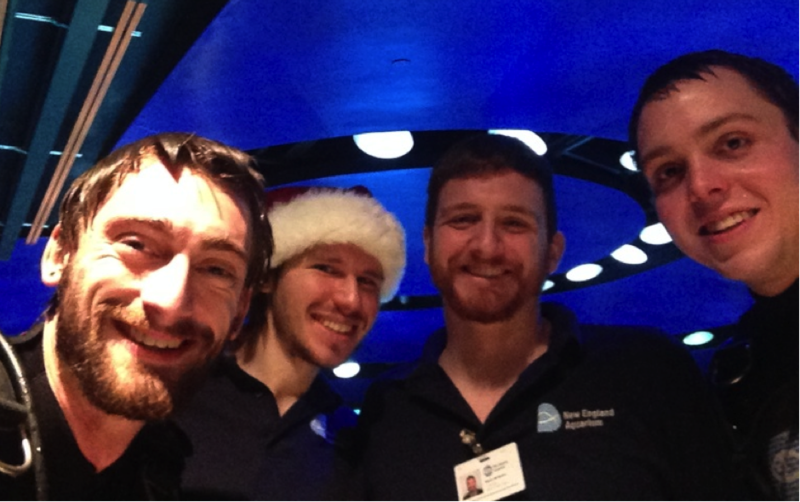 Merry Christmas and Happy Holidays from the Giant Ocean Tank Divers! 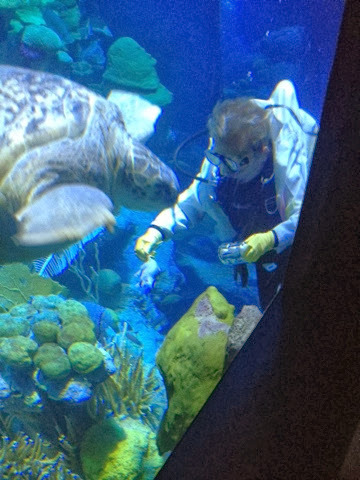 Divers, mostly volunteers, hop into the tank with scrub brushes every day. 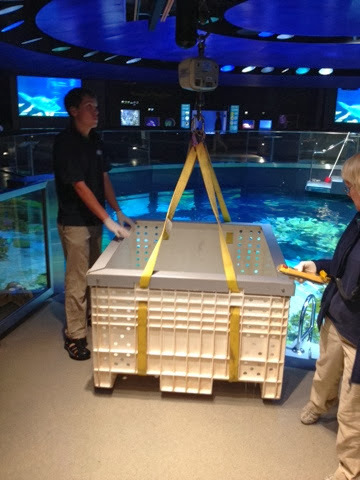 They're charged with scrubbing our colorful new corals so they can remain vibrant and lovely. It's a job that has to happen every day. After all, if you have bright lights you're going to get some happy algae. In this video, Daire has a curious onlooker while he's scrubbing the algae at the top of the reef. This bridled burrfish is related to all of our other spiky puffers: balloonfish, porcupinefish, spotted burrfish and striped burrfish. But perhaps he thinks this brush is his kin! 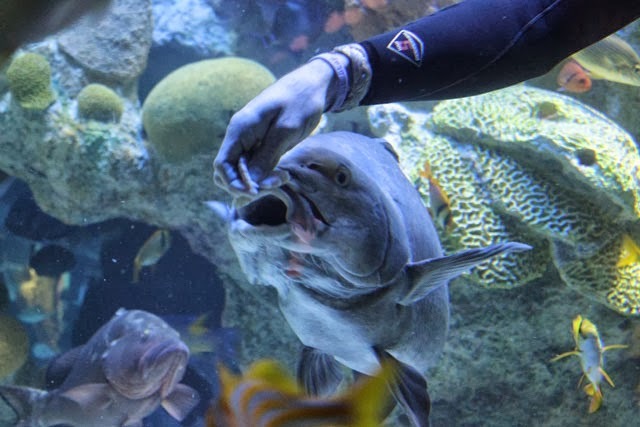 One of the roles of a GOT Aquarist is to ensure that all of the animals in the Giant Ocean Tank are happy and healthy. 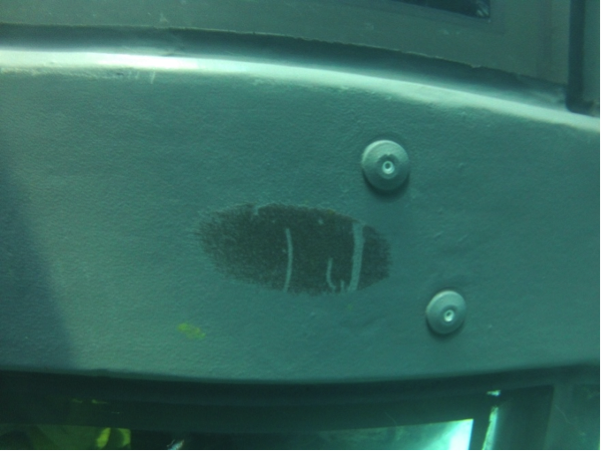 On each of our dives we make observations and monitor the behaviors of the animals as a way to keep track of animal health. Occasionally we are rewarded with something really exciting! 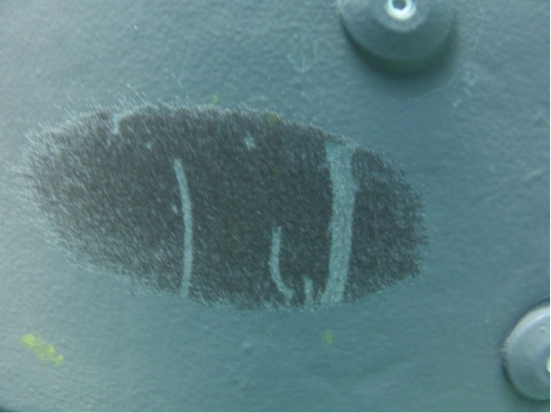 Can you tell what this is? I’ll give you a hint: It is one of the signs of a happy and healthy fish. Fish that are well-fed and relaxed are able to spend energy on things that are not critical to their individual survival. 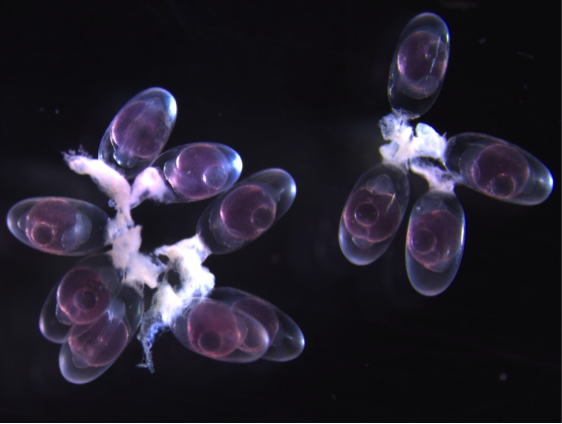 In the GOT this sometimes results in fish spawning, or laying eggs. 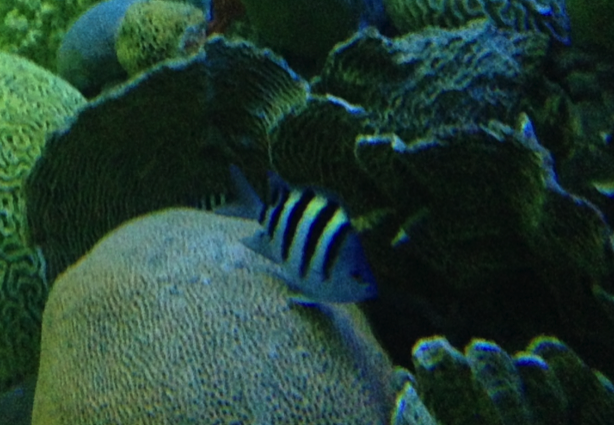 Some fish release their spawn into the water while others, like our Sergeant majors, lay their eggs on a surface. 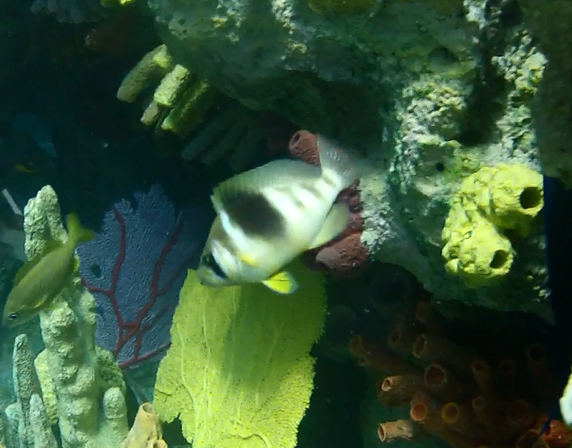 A while back we talked about where baby fish come from and raising fish at the Aquarium, and it is great to know that post-renovation the fish are happy with their new home. 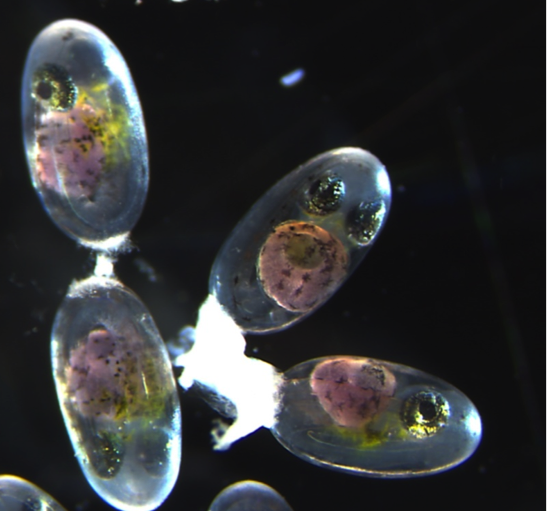 Through our continuing partnership with Roger Williams University and recently with other institutions across the United States and we are working on methods to collect and hatch these eggs. 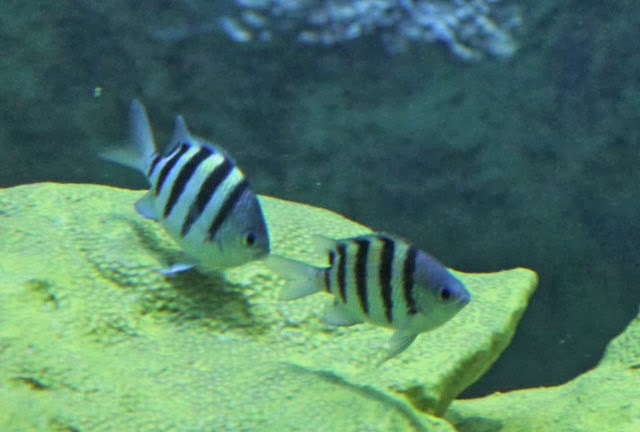 Eventually we hope to use these captive bred fish to augment our tropical collecting efforts allowing us to further reduce our impact on wild populations. 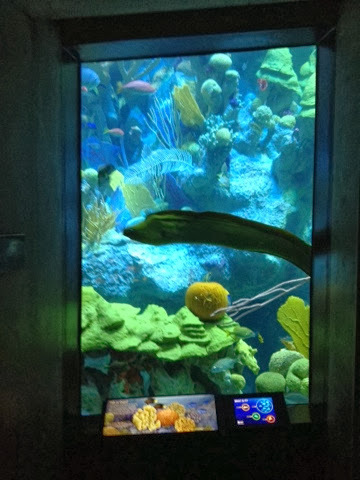 The Aquarium is closed but "the fish gotta eat!" So do the turtles. 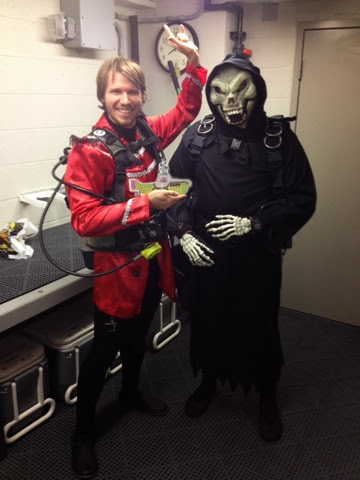 So do the divers! 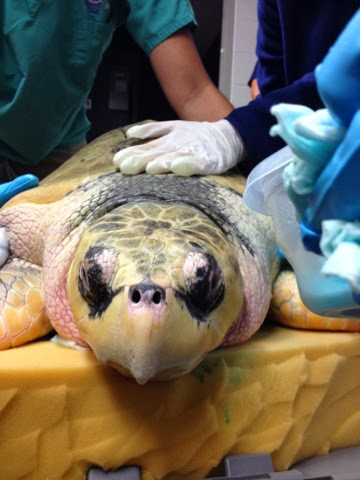 Myrtle eating a healthy snack of "turtle gel"
A special thanks to Shannon, Jess and DJ Mack for volunteering their time on this holiday - it does not go unappreciated! 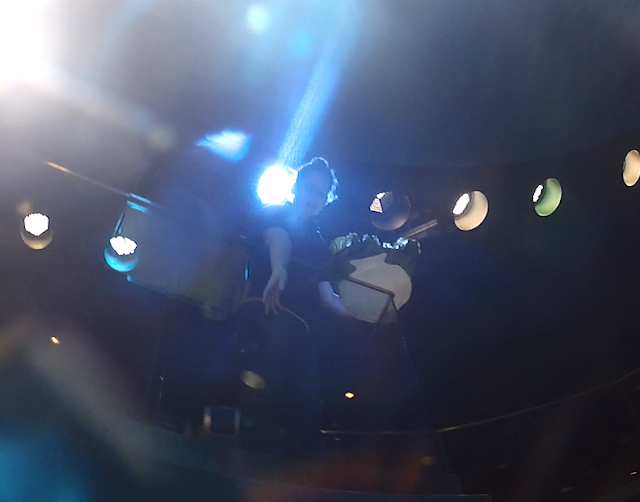 I took the GoPro into the GOT today to well, "get something cool". I didn't really have a set goal, but I was optimistic I'd find something neat to take a video of. Perhaps some mating behavior or even the opposite of that: aggression from one fish to another. 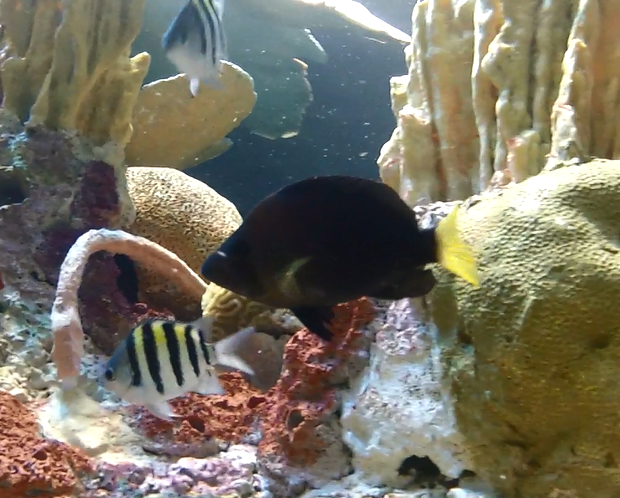 What evolved was a video of all four species of hamlets that live in the Giant Ocean Tank! 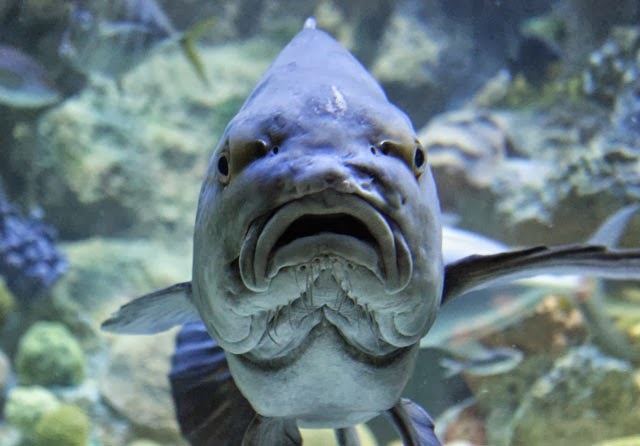 Hamlets are members of the sea bass family, Serranidae, which also includes basses and groupers. 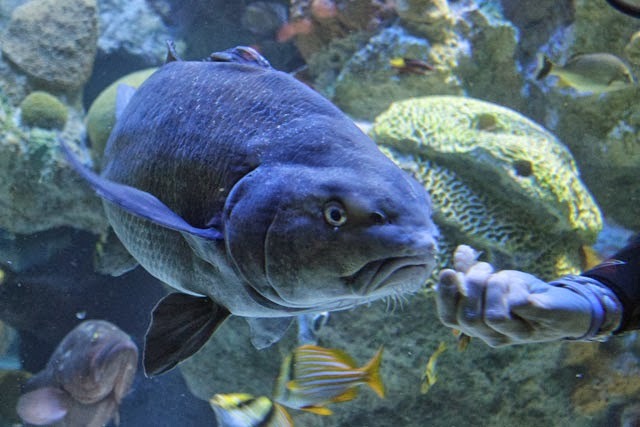 Unlike many groupers and basses, hamlets are quite small—never getting bigger than 4-5" long, and look like miniature versions of our larger groupers. 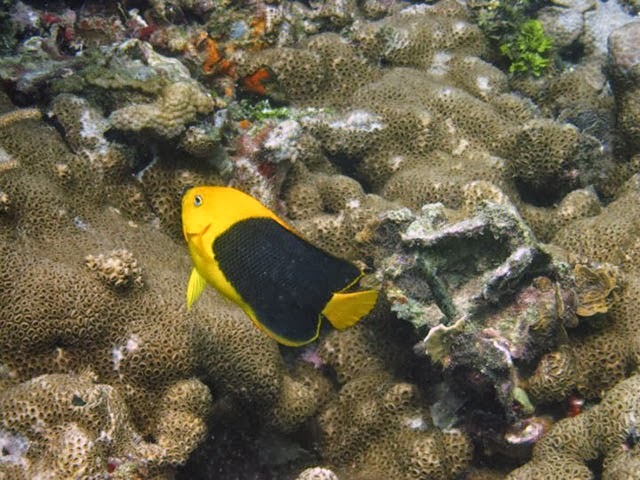 Hamlets are found mainly around coral reefs in Florida waters and throughout the Caribbean, especially the Bahamas. 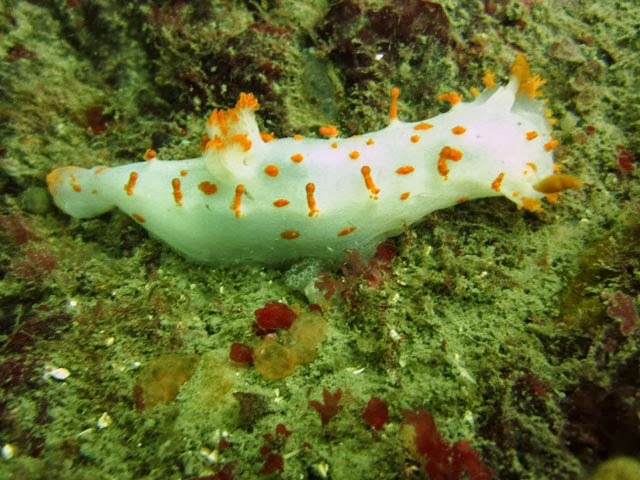 There are 11 known species. 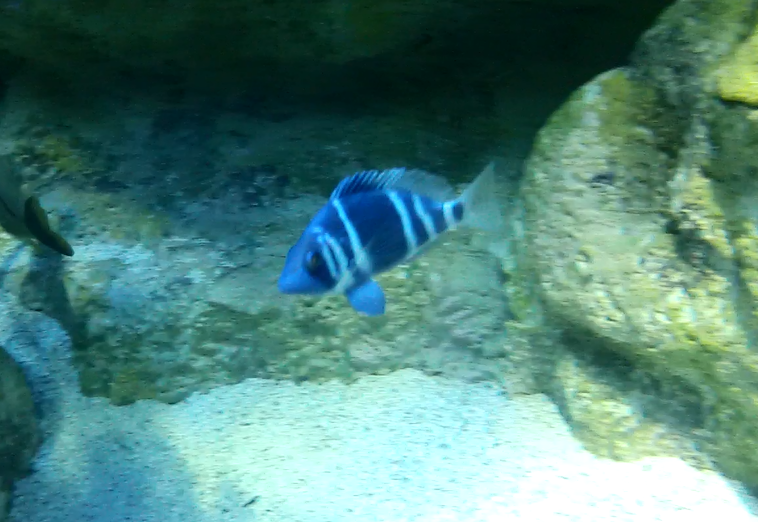 We have four of them in our big tank. 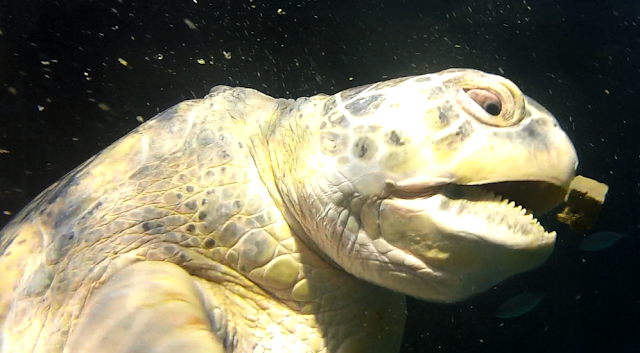 Hamlets do tend to be shy, but in the GOT they have gotten used to divers, which made it possible to get these shots. 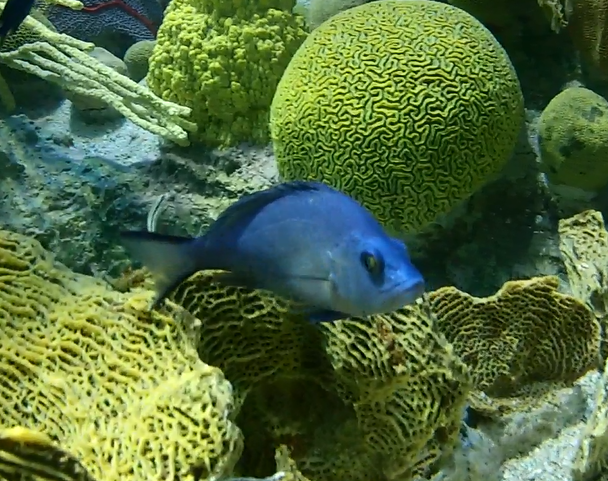 Come by sometime and see if you can spot these beauties among the hundreds of fish darting among the coral! 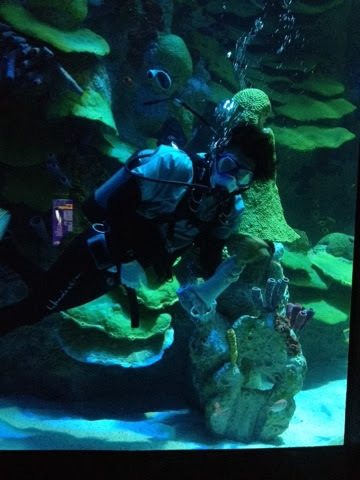 As promised in this last post, here's video of the black drum navigating the new corals inside the Giant Ocean Tank. As he swims overhead you can clearly see the barbels that make this fish look bearded. Pretty appropriate given our bearded World Champion Boston Red Sox! 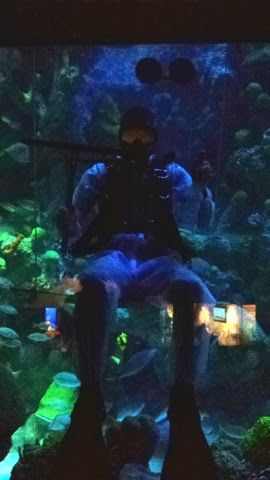 Another unique thing about black drums is that they - like all drums in the Giant Ocean Tank - have the ability to produce a low-pitched drum-like (hence the name) resonant sound by vibrating the muscles surrounding their swim bladders. This is likely for mating or territorial purposes. However, it's very rare to hear this in the GOT... Toronto is our only black drum. 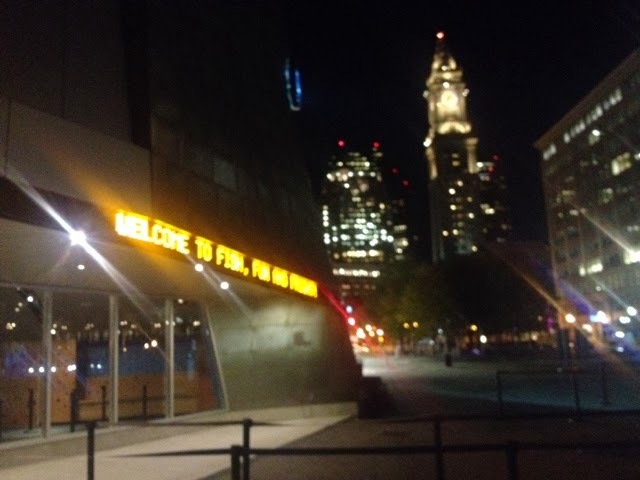 Today Red Sox nation is swarming over the city, wearing their pride on their sleeves and caps, cheering for the home team at the victory parade. 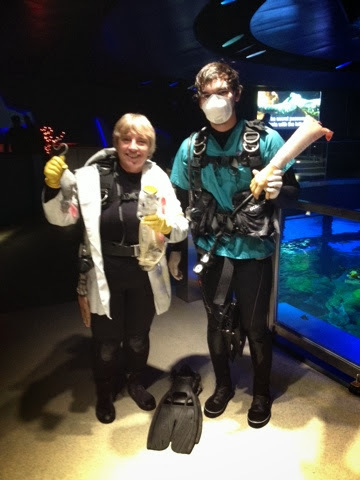 Here in the Giant Ocean Tank, the divers are getting in on the act, too. 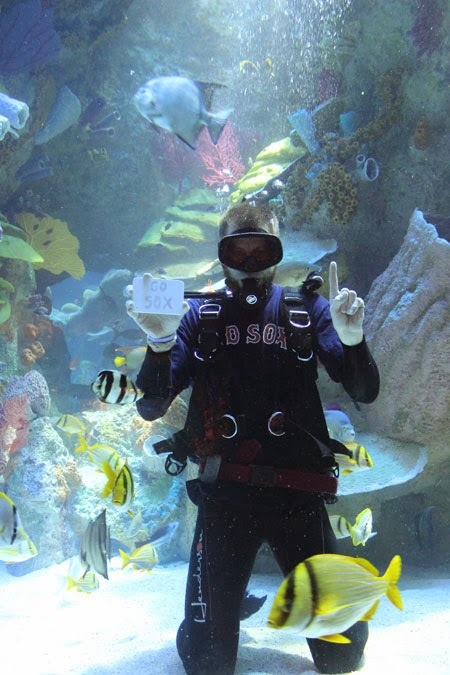 So after the confetti has fallen and the duckboats have passed, come on down to the Aquarium and see the divers in their Red Sox gear. 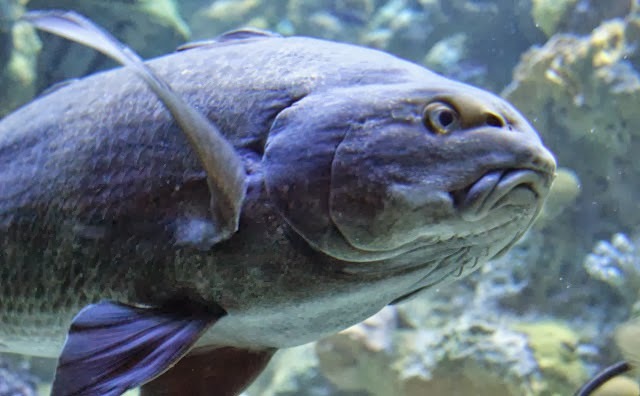 You might get to see the shy black drum, too! See lots more pictures of him here. 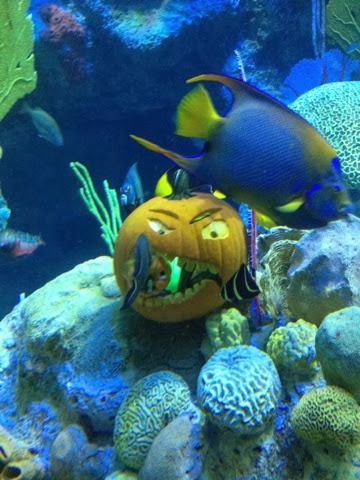 Our annual members only Halloween event—Fish Fun and Fright!—happened last night. 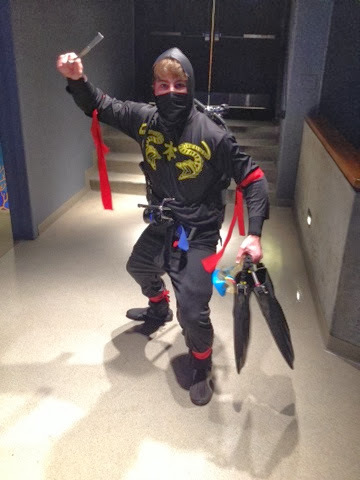 In GOT-land, that can only mean one thing: divers in costume!! Hello everyone! 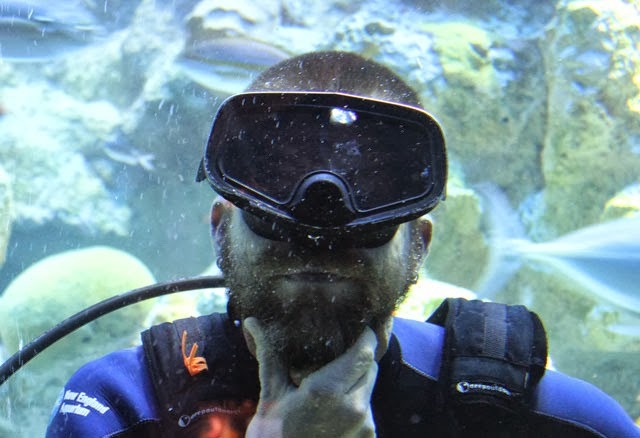 My name is Sean and I am the newest addition to the team of divers that helps care for and maintain the Giant Ocean Tank at the New England Aquarium. 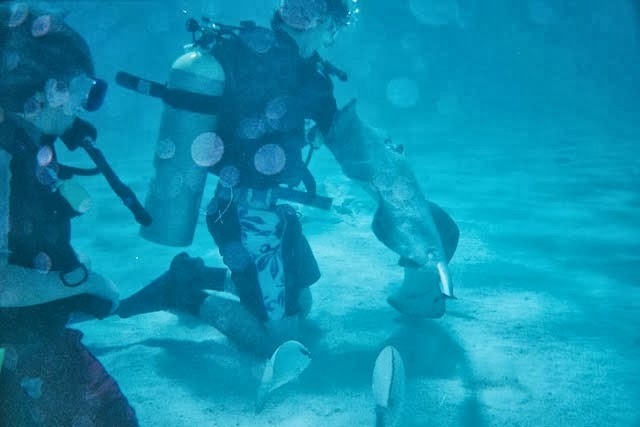 My love of diving started at a relatively young age and out of that passion grew a deep appreciation for all things related to marine life. 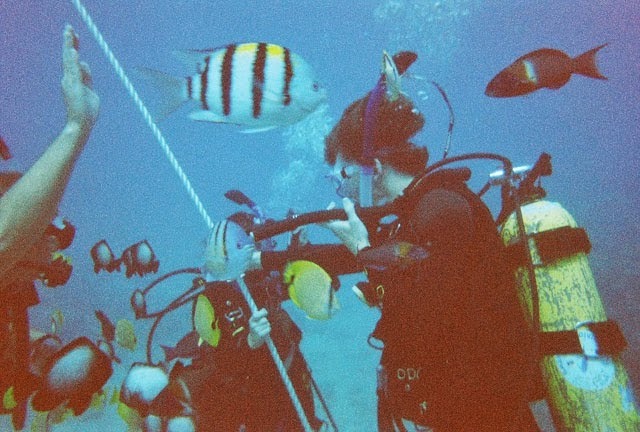 I first started SCUBA diving in high school and was very fortunate to spend several vacations diving with my family. It wasn’t until my sophomore year at Northeastern University that I began seriously exploring career opportunities in marine science. 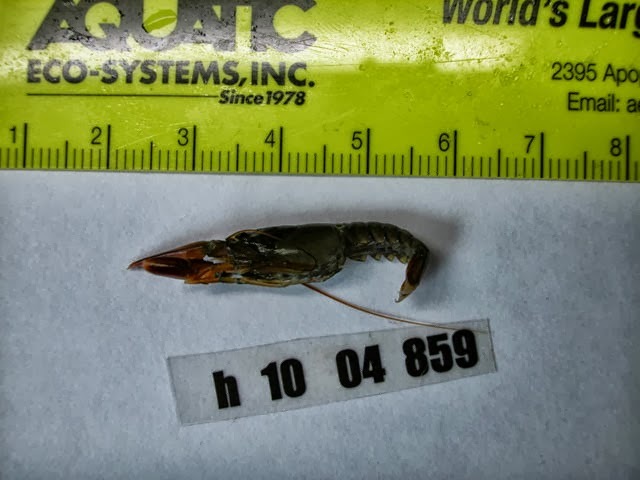 I started as a volunteer, and later an intern, in the Lobster Research and Rearing Facility at the New England Aquarium assisting with research into lobster shell disease. The following year I participated in a research diving program at Northeastern called Three Seas. 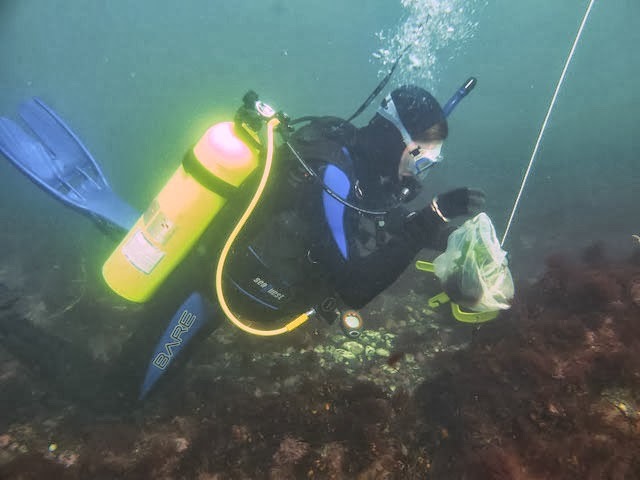 During Three Seas I spent many hours conducting marine ecological field research on the Massachusetts North Shore, studying the health of coral ecosystems in Panama and exploring kelp forests in Washington state. 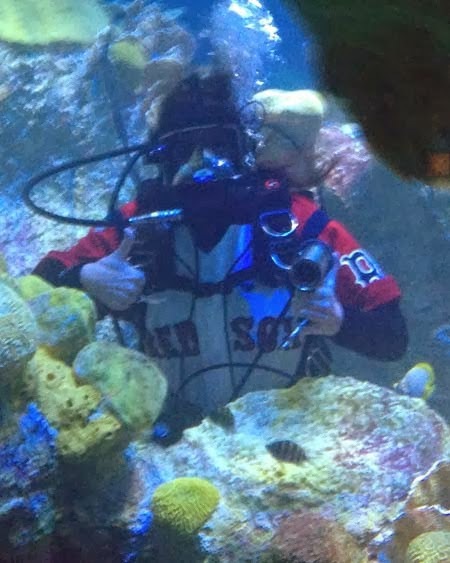 During the summer of 2012 I worked as an intern for the Giant Ocean Tank and after graduating Northeastern in December of that same year I was hired as a full-time aquarist. 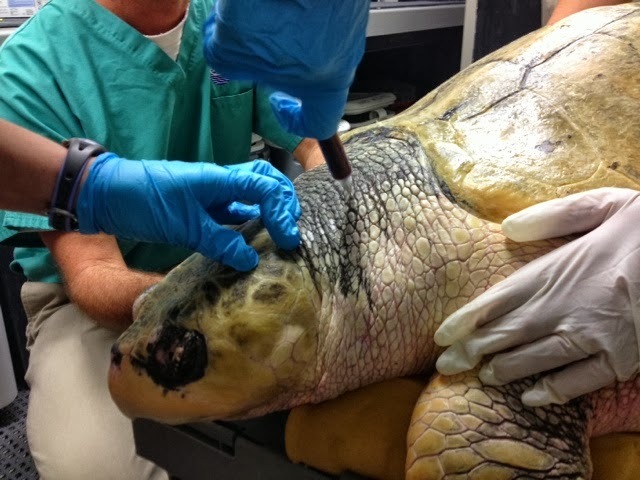 I am very excited to be working at an institution that helps people explore the mysteries and majesty of marine life. I believe that sharing my passions and experiences can help inspire others to take action and work to protect our oceans. 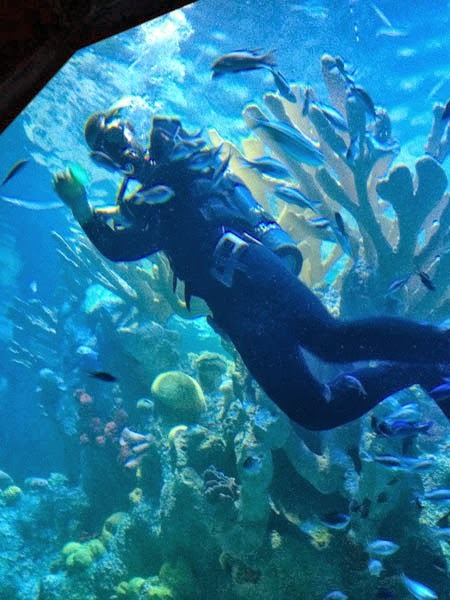 So the next time you visit the New England Aquarium don’t hesitate to wave, say hello or ask a question. I love to talk about my work! Ari is our Kemp's ridley sea turtle. 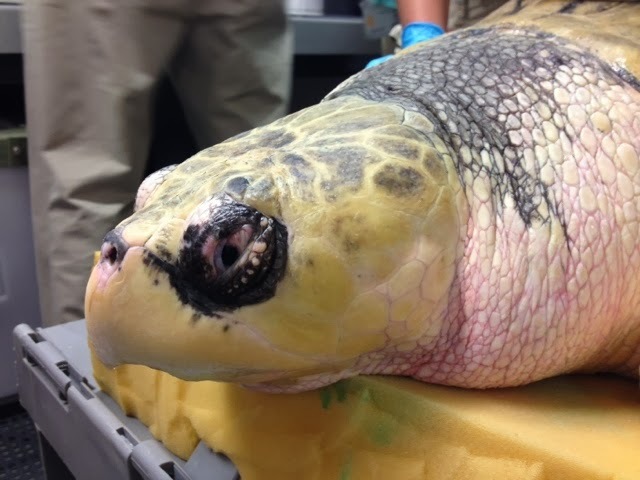 She arrived from New Orleans in 2009 after being rehabilitated at the Aquarium of the Americas following a boat strike in the Gulf of Mexico. 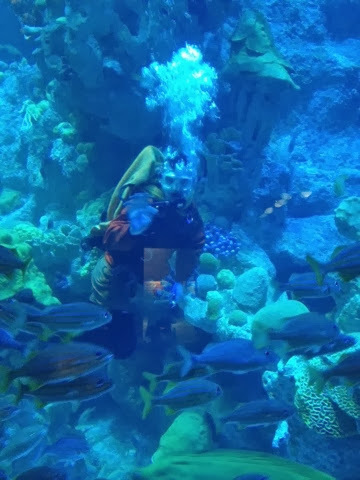 Since then, she's lived her life in the Giant Ocean Tank (as well as the Penguin exhibit during our 10-month GOT renovation). 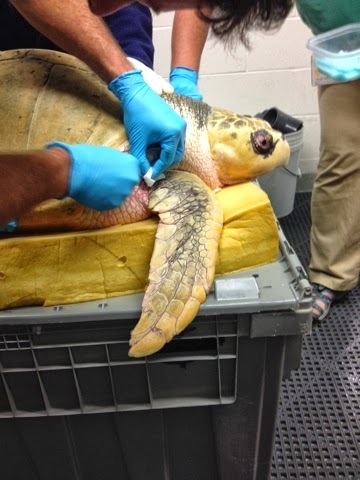 Twice a year, our vets perform regular exams on all of our sea turtles and this week it was Ari's turn. One of the things that we learned from recent past blood tests is that her hormone levels are higher than normal, which could be the cause of her current extended fast. Therefore, she received implants for attempted suppression of ovarian activity, one in each shoulder. Hopefully this will bring back her appetite. 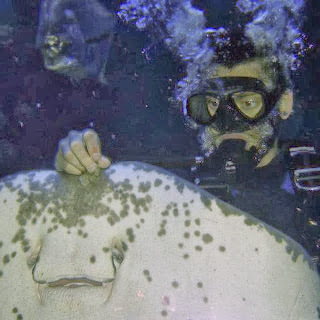 Ready to return to the tank Ari? 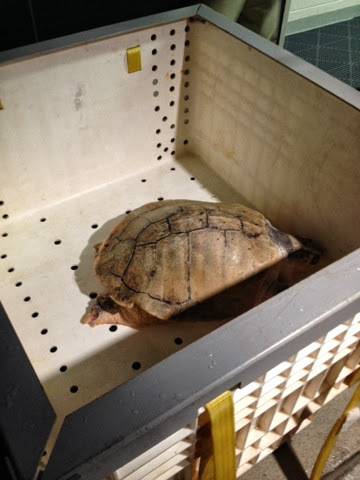 Kemp's Ridley, Lepidochelys kempii, is listed as critically endangered. Ari is living in the GOT only because she would not be able to survive in the wild. We are fortunate to have her because it gives visitors a reason to learn about them and potentially become stewards for their survival. 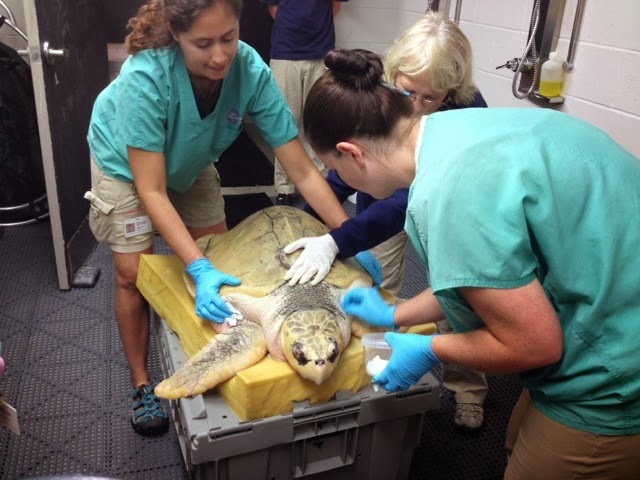 Ari is back in the tank safe and sound and continuing to wow the visitors (with her abilities to nap).